I only spend my time on the last 2 years in Forum games though. . .
Another video of it, because why not. I think I'll update my post with one of the games I'm playing. Looks like you need to make another profile post! ToLazyToPickAName, Duke of Gwynedd, LumiNyte and 5 others like this. Ahhh, The Last Post Wins, A Cesspool Of Likebombing. If the above user's profile pic was an NPC, what would he/she sell/do? "grant the immunity from weather for a short time." You have just notice? Well. I was writing that on tappaja profile then realize later he isn't the latest message. THE STEAM AWARDS is back again. Wonder which category I should add Terraria in. You can't dominate more than one award for a game. This game doesn't fit for the best "VR game" award too. On side note. I just moved Terraria to "better with friends" award instead. Hi Since your on plantera Can You Help with Mechanical Bosses On PS3? And since you mention that I'm on Plantera. That title have nothing to do with my game progress. For some reason search function is totally useless on this forum. Ok, I'll admit it. I've been distracted by other games that I haven't touch Terraria for a year now. Sockmonkey367 and Daikonradish like this. Same. Got burned out on the game. It's been 1,095 days since I've joined here? That's a long time. Sockmonkey367 and FlyKip like this. Yup. That's a long time. Sockmonkey367, Daikonradish and FlyKip like this. You should consider taking a repair or fix at some point. Just a friendly question: Who's your profile picture of and what are they from? Sockmonkey367, Crimsion_Mc_Black and Crimwolf like this. Apply liquid nitrogen to burned area. Jk it was a nice joke. Mine are far straighter than yours. 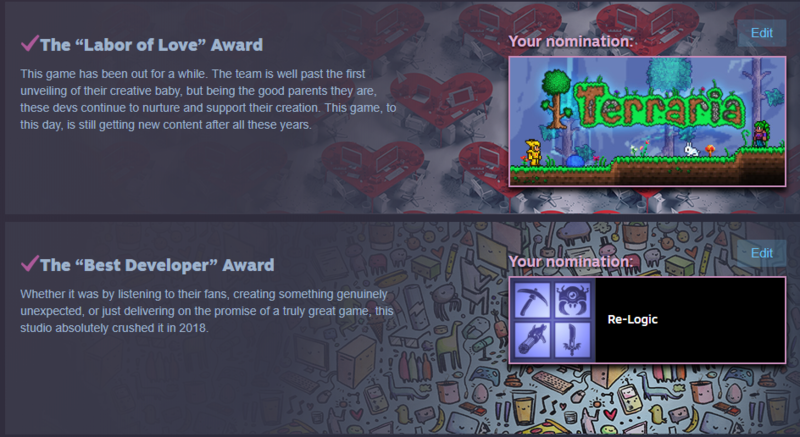 Terraria didn't win any steam award.. How sad. Sockmonkey367 and OptiPri like this. I still feel it's award worth but going against triple A games doesn't really fare well for an indie. We should be glad it even got nominated at this point. And twice even. I guess memory is the ultimate weapon. Sometime I want to sleep for 24 hours but Real life wake me up. Sockmonkey367 and No mans sky like this. I like to playing game, reading comic book (rarely novel), drawing,playing with cat! English isn't my primary language, so if you spot my grammatical error, feel free to correct it. I have been away from Terraria for a while. But don't worry. I planned to come back to it. If you like good story, I recommend a few that you might want to have a look.